More than 200 jobs are being lost after energy firm Powergen said it plans to close two power stations. Powergen confirmed on Thursday it would close High Marnham in north Nottinghamshire and Drakelow C in east Staffordshire, near Burton upon Trent. The firm said it had no plans to close Ironbridge in Shropshire, which was the third site acquired in Powergen's takeover of TXU's retail business last year. Powergen, the UK's largest energy supplier, said it has had to deal with over-capacity and low energy prices. The two stations, which had been partly mothballed, are expected to close in the Spring. A spokesman said they had reached "the end of their working life". 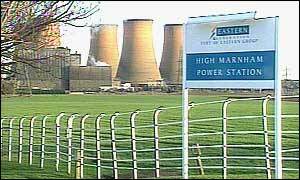 Some 119 jobs are to go at High Marnham with a further 88 job losses at Drakelow, said Powergen. Spokesman Jonathan Smith said: "We are obviously very hopeful we will find positions for many of the staff elsewhere. "There will be a few who will be very close to retirement age I'm sure and they will be offered early retirement. "We are hopeful they won't be anybody who will be made compulsory redundant but we cannot rule it out. "Though we are offering them counselling we are doing everything we can to support them." The two power stations are coal-fired and are among the oldest in the country - High Marnham was commissioned in 1959 and Drakelow in 1965. It is feared their closure could have a knock-on effect on the struggling British coal industry. The closures are subject to review by the industry regulator Ofgem. Powergen also remains on course to complete the mothballing of Killingholme, its gas-fired station in Lincolnshire and Grain, its oil-fired station in Kent.